Marvel’s Ant-Man, a film about a man who can shrink into the size of an ant and gain super-strength, hits cinemas on 17th July. Come on, it doesn’t sound that weird. We had a living tree and talking racoon in Guardians of the Galaxy after all. Starring Paul Rudd in the lead role with Michael Douglas as his mentor, it marks the character’s first time on the big screen, and superhero studio Marvel has teamed up with IMAX to make it a moment to remember. As of 16th July, 100 tickets to see the film in jumbo-sized IMAX screen glory will be scattered across London, Birmingham and Manchester, giving you the chance to check out the new movie for free. 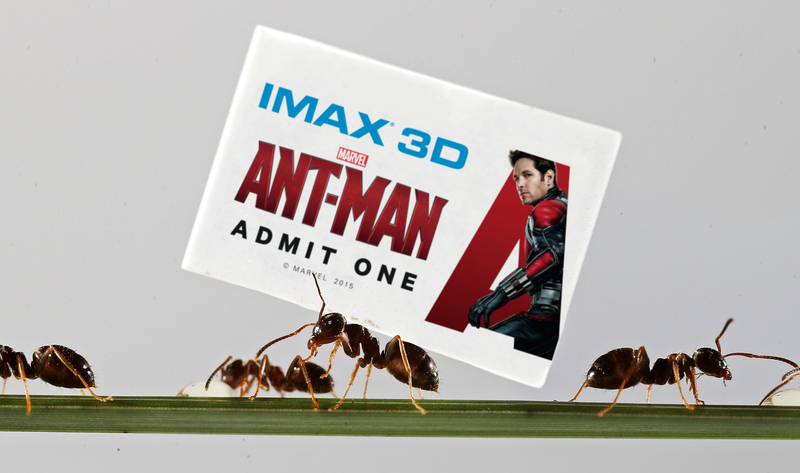 The free tickets are ant-sized at just 5x10mm – you didn’t think it was going to be easy did you? However, clues to their locations are available by following IMAX on Twitter. If you’re successful in the search, you’re invited to tweet a selfie to @IMAX with the #IMAXAntMan hashtag.